listing the key astrological events for the entire year! Download this unique 2-page PDF immediately upon purchase. When you purchase AEG, you can download all the 4 time zones* AEG comes in. 100% satisfaction guaranteed! If for any reason you are not 100% satisfied with AEG, just let us know within 15 days of your purchase and we will refund the amount of your purchase, no questions asked. We want you to be happy with your Astro Event Guide! AEG is uniquely informative, handy and concise in an easy-to-use and not-to-be-found-elsewhere format. Get all four USA time zones in one purchase! Listing of all key astrological events for the year. Key aspects between planets (included are Mars, Jupiter, Saturn, Uranus, Neptune and Pluto). All this info color-keyed and on two pages for quick reference! This is a wonderful tool for Astrology schools (contact us for discounts for quantity purchases). “Thank you for continuing to offer this wonderful product! I write an astrology column and use it constantly for reference. What a great service you provide. and well planned product! 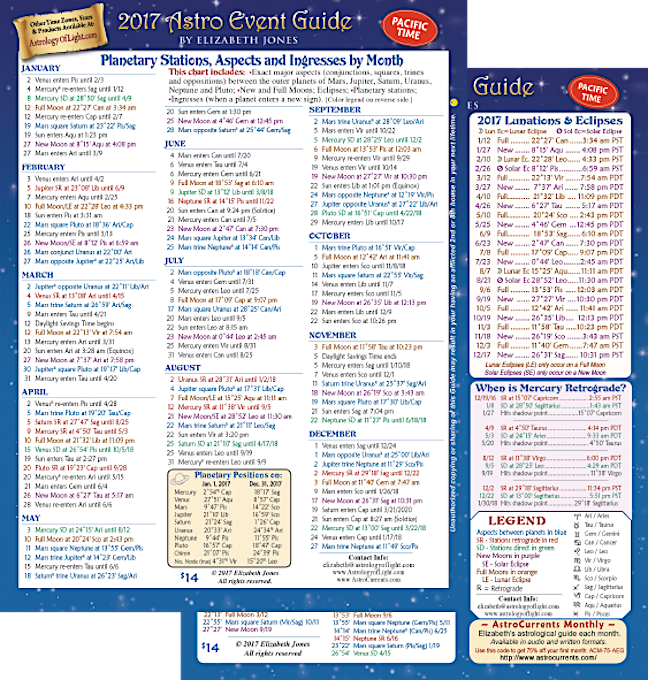 I will be keeping the Astro Event Guide nearby! “This reference guide is ingenious. Like others, I cannot tell WHY no one has done this before! As an astrologer I know the amount of time it would take me to compile a year’s worth of quick-reference planetary info. The convenience of having your yearly Astro Event Guide close at hand would be a bargain – even at twice the price!